SCE Video allows you to load a video file into MADRIX and display it on your LEDs. ▪ Filter - Applies a multiplicative color filter to the image. The default value is White. ▪ Position - Defines the position of the image in X, Y, and Z [in %]. The default values are 0, 0, 0. Valid values range from -1000 to 1000. ▪ Playback Rate - Defines the speed of the Image Table and how fast images are changed. - The default value is 1, which means that the Duration of the Image Table for each image is used. A rate of 2 doubles the speed and cuts the Duration in half, for example. - Is only supported by specific video codecs [such as, QuickTime]. ▪ Extrusion - Adds depth to the input; i.e. duplicates the input image [in %]. This is mainly relevant for 3D. The default value is 100. Valid values range from 0.01 to 100. Open - Allows you to load a video into MADRIX. Select the file on your computer or another source. Start Time - Displays the Start Time of the video. The time format is hours:minutes:seconds [HH:MM:SS]. - Also allows you to enter an individual Start Time to begin the video at a different position. Spacebar - Resets to the default value. Set Start Time - Allows you to define an individual Start Time to begin the video at a different position. First, please enter a different Start Time. End Time - Displays the End Time of the video. The time format is hours:minutes:seconds [HH:MM:SS]. - When loading a video file, MADRIX automatically displays the End Time for the loaded video file. - Also allows you to enter an individual End Time to let the video end/stop at a different position. Set End Time - Allows you to define an individual End Time to let the video end/stop at a different position. First, please enter a different End Time. Position Slider - This slider shows the current position of the video. - You can use the slider to set a different position. - You can use the white triangles to define a different Start Time and End Time. Current Position - Displays the current position of the video. The time format is hours:minutes:seconds [HH:MM:SS]. Skip To Start - Instantly skips to the Start Time of the video. Step 1 Frame Back - Allows you to go 1 frame backward. Is only supported by specific video codecs [such as, QuickTime]. Play Backwards - Allows you to play the video backwards. Is only supported by specific video codecs [such as, QuickTime]. Play - Starts the video playback. Skip 1 Frame - Allows you to go 1 frame forward. Is only supported by specific video codecs [such as, QuickTime]. Skip To End - Instantly skips to the End Time of the video. Pause - Allows you to pause video playback. The video stops at the current position. Playback Mode - Allows you to define the playback behavior. Once [Set Position To End Frame] - Plays back the video normally, one time, from start to end. The Position will remain at the End Time. Once [Set Position To Start Frame] - Plays back the video normally, one time, from start to end. The Position will jump back to the Start Time. Loop [Default] - Activates forward [or backwards] looping. The video file will be played back repeatedly in a loop. Bounce - Activates changing the playback direction when reaching the video End Time or Start Time. Is only supported by specific video codecs [such as, QuickTime]. Autostart - Automatically starts the video after it has been loaded into MADRIX or after changing a Storage Place. Deinterlace Mode - Allows you to choose from several Deinterlace Modes. Bob - Uses one set of 25 frames [even or odd] and copies missing information from the pictures provided. Pixel lines are copied to create a full image. Activate Top Field First in order to process the frame set with the first pixel line first. Bob Linear - This is the recommended deinterlace mode. It uses one set of 25 frames, but builds an average for the missing pixel lines. Activate Top Field First in order to process the frame set with the first pixel line first. Discard - Simply dismisses missing information. Thereby, pixel lines are excluded. This results in half of the original resolution for the final image. Activate Top Field First in order to process the frame set with the first pixel line first. Seamless - Activates or deactivates a continuous stream of the video image. MADRIX will automatically display the video image again to create a continuous display. Stretching / Aspect Ratio - Allows you to choose the aspect ratio of the video. The default value is Matrix. Example: Your virtual LED matrix is 10 x 8 x 4. Now, you have prepared a video and want to display it not only on the first Z-level or use Extrude, but on all 4 Z-levels. Then, you would let MADRIX create 4 slices. MADRIX and the SCE Video Effect do not support playing the audio track of video files or providing sound output. ▪ To play back video, a video codec is required. Each video file format requires a special video codec. ▪ Windows already provides a number of codecs, but often additional codecs are necessary. ▪ If some features described above are not available, the video codec might simply not support this feature. ▪ All video codecs that are installed on your computer are automatically supported by MADRIX. ▪ If you are experiencing problems, read below. ▪ If you want to use all the features of the SCE Video effect [such as frame skipping or backward playback ], use Apple QuickTime videos. ▪ Apple QuickTime videos are of the *.mov or *.qt file types. ▪ Make sure that Apple QuickTime 6.0 or above is installed. 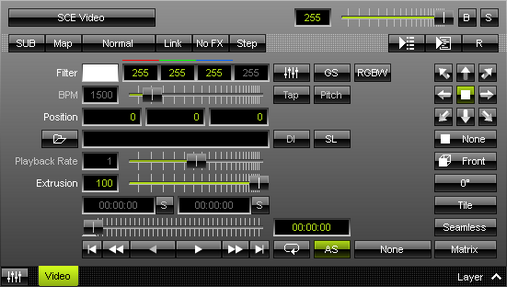 ▪ MADRIX can automatically activate and load QuickTime when MADRIX starts. ▪ If MADRIX is not able to play back a video file, make sure to install the appropriate video codec on your computer. ▪ Make sure to install Apple QuickTime. ▪ Collections of video codecs are available in so-called video codec packs. ▪ If you install a new codec pack, make sure to uninstall a previously installed codec pack first. Often, it also makes no sense to install multiple codec packs since similar codecs may not work correctly anymore. ▪ When using video files, MADRIX will automatically locate these files on your harddisk. It also saves the folder location internally to access the video file. ▪ But MADRIX will not save the videos in your MADRIX Setup File! ▪ In order to play the setup on a different computer, you will need to copy your videos, too. Make sure that they are placed in the same folder location. ▪ The SCE Video effect is also able to play back MADRIX Record Files [of the file type *.mrec].